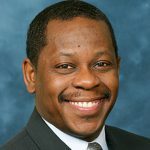 T. Anthony Denton is senior vice president and chief operating officer of the University of Michigan Hospitals, Health Centers and Medical Group. He’s served as the chief operating officer since 2004, and as acting chief executive officer and chief operating officer of the U-M Hospitals and Health Centers from June 2014 through December 2015. Denton obtained his bachelor’s degree from Northwestern University in 1979. He obtained his master’s degree in Health Services Administration from U-M Health in 1981, followed by a law degree from the University Of Detroit Mercy School Of Law in 1987. Denton joined U-M in 1981 as an administrative fellow in Academic Health Center Administration. His career started within Human Resources, with an emphasis on labor relations, compensation and workforce planning and implementation strategies. Denton participated on the start-up team for MCare HMO during the mid-1980s, serving as manager of Corporate Affairs and Member Services. Denton transitioned to Hospital Administration in the early 1990s. Denton has served and continues as an active member on multiple UMHS senior leadership committees. He was chairman of the board of the Michigan Visiting Nurse Corp. from 1997-2003. Denton has been active on state and national boards, including a five-year term as Commissioner on the Board of the Joint Commission. Denton is currently a Trustee on the Michigan Health & Hospital Association Board of Trustees. Denton has served on several community boards and councils, including the local Red Cross Board of Directors, and is presently a Co-Chair of the University of Michigan’s United Way Campaign (2014-16) and Leadership Chair for the United Way’sWashtenaw County Campaign.Denton also is a member of the Washtenaw Health Initiative Steering and Finance Committees. Denton has served as corporate chair for the area American Heart Association heart walks, and has been a county area chairman for the Juvenile Diabetes Research Foundation. Denton is also an advocate for “The Education Project for Homeless Youth” and Food Gatherers.